It is well known that a wind turbine’s operational power performance (i.e. power curve) may deviate significantly from expected, prior to wind farm construction. This is a salient offshore wind industry challenge as it directly impacts the accuracy of a proposed project’s economic viability (i.e. Annual Energy Production (AEP)). In part, preconstruction energy yield uncertainties are related to limitations in the standard approach for estimating turbine available power. The current practice for power prediction relies on hub-height wind speed values only, as hub-height wind is assumed to be representative of the wind conditions throughout the turbine’s entire rotor-layer (~40m-200m), thus the shape of the Vertical Wind speed Profile (VWP) is logarithmic-like. It is now known that the VWP shapes may deviate significantly from logarithmic-like behavior and therefore drive large uncertainty in turbine available power, regardless of similar hub-height wind conditions. To assist with available power uncertainty reduction, a new Rotor-Equivalent Wind (REW) term was introduced to the power equation to account for VWP shape variability vis-a-vis meteorological conditions (i.e. wind speed and direction shear and turbulence) throughout a turbine’s rotor-layer. However unfortunately, given a severe lack of offshore met-ocean measurements throughout a turbine’s rotor layer, VWP shapes are also often assumed to be logarithmic-like during the preconstruction phase of development, thus the advantage of uncertainty reduction from REW available power techniques are limited. As trends towards larger offshore turbine rotor-swept areas continue, measurement and prediction of unexpected VWP shapes driving preconstruction energy yield uncertainties are needed. 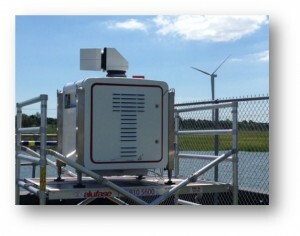 To help with such efforts, the U-SPARC R2O team uses Doppler wind lidar and other atmospheric measurements in the coastal Mid-Atlantic environment to classify the variability of VWP shapes using goodness-of-fit to mathematical expressions and other techniques. Once VWP types are classified, relationships with regional meteorological regimes are also investigated to understand the predictability of VWP variability. In addition, the seasonality of coastal VWP types are explored and a long-term reference wind resource database constructed, using scanning Doppler wind lidar measurements in Ocean City, Maryland. Finally, the sensitivity of turbine performance to distinct VWP classes and relationships with rotor-layer atmospheric stability are investigated using coastal turbine power data. An overview of the U-SPARC R2O efforts can be found here.